Let me begin by noting I am a technologist; can’t wait for the newest version, the next big thing. I don’t just purchase equipment, I become one with it. Pouring over research to glean the slightest benefit or savings for purchases ranging from headphones to big screen TV’s (comments on the effective use of my time may be reserved for another time). Yet in just a week’s time I cannot help but face the hard lesson of consumerism: Regardless of what CNET, Consumer Reports, or Bizrate says, whatever you end up buying has as much a chance of being crap as anything else. I bought a Samsung 50 inch plasma TV from Amazon. Samsung rocks sayeth the tech gods. After about ten days, the plasma exploded leaving the screen dark. 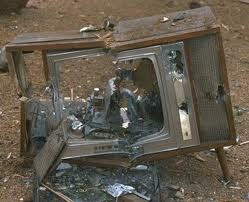 Apparently, if the TV is not shipped right side up, the plasma material can become volatile. Thus, I now must disassemble the TV, somehow put it back into the giant box, and send it back from whence it came. In August, I replaced my underperforming laptop with a sizzler. Dell Studio 15 loaded with an Intel I7 Core processor, 6 MG of RAM, 1 MG video; you get the idea. In the last month, this so-called quad multi-tasker has been freezing up on me about 3 to 4 times a day while performing very average tasks. Even MAC is not immune. My daughter’s MAC Book, which does perform quite well, has a plastic casing that is peeling off as we speak. Not to be outdone, after I sucked off the cord of the Wii’s space bar with the vacuum cleaner (don’t ask), I purchased a wireless space bar. Hurray! Well, only if you can play a game in less than 10 seconds cause that’s all the thing would stay on for. Now as I am sure you know, the time put into researching a product pales to the time and effort of returning it. I almost think that’s what the manufactures are counting on; that about half of the items will not be returned simply because it’s just too arduous. There’s a real and growing disconnect between invention and manufacturing. I can’t explain it except to point out the obvious geographic distance between the inventors and manufacturers. I also don’t have a solution except keep your receipts, and always ask to speak to a supervisor!